Swim Spas are big and heavy. Getting them delivered and in place can be a challenge. When a long reach is required, sometimes the only practical solution is to use a crane. The crane is position as close to the swim spa installation as possible and the side braces (i.e. outriggers) are set, usually on blocks of wood to distribute the load. Next, straps are fished under the swim spa to "rig" the load. And the swim spa is then lifted up over obstacles and lowered into place. Overhead power lines can be a major obstacle. To lift over or under power lines it is often necessary to schedule a planned power shutdown. To get the straps out from under the swim spa after it has been lowered in place, the swim spa is often place on bags of ice (i.e. the straps are removed, and when the ice melts the swim spa will rest flat on its base). A boom truck is basically a truck with a small built in crane. 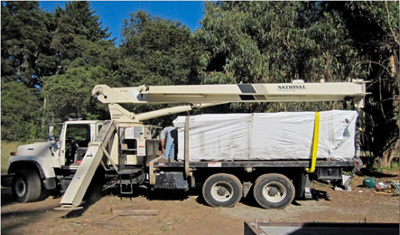 If the installation location has paved access, it may be possible to offload the swim spa with a forklift. Usually the swim spa will have to be slid or rolled into its exact location. A Tele Handler is forklift truck on steroids. Tele Handlers have telescoping forks and usually have large tires for crossing rough terrain. Common brands are Lull, Gradall, JLG and Sky Trak. 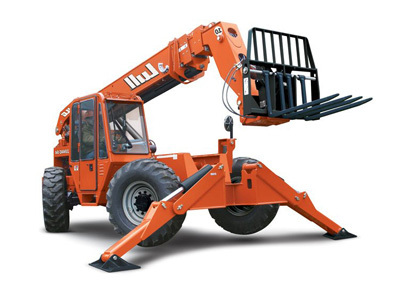 Depending on your installation location, a tele handler may be the best solution. The swim spa is transferred to a special rollback trailer, either by sliding the swim spa on the trailer bed or by putting steel pipes or schedule 40 PVC pipe underneath the swim spa with a crowbar and rolling the swim spa. Once the rollback trailer arrives at the delivery address, the swim spa is slid or rolled off the trailer into place. 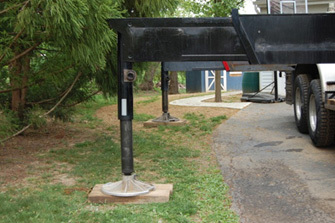 The trailer tips down to the ground as the swim spa moves toward the edge of the bed. 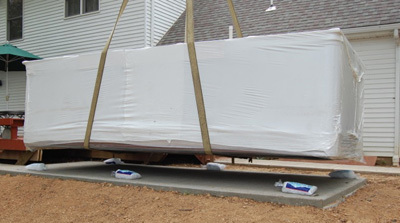 This method of delivery is only appropriate when the swim spa can be easily rolled / slid into place from a location that the trailer can access. Swim spas have been hand carried into place by lifting teams. And in some locations, helicopter offloading is the only possibility (see attached video).